AC Milan boss Gennaro Gattuso has issued his players a warning as the battle for a top-four spot in the Serie A heats up. The Rossoneri are currently down in sixth-place in the standings and two points adrift of fourth-place AS Roma, who defeated Chievo Verona 3-0 on Friday night. Therefore, victory against Cagliari is a must on Sunday for Milan if they are to retake their spot in the top four of the table in a bid to return to Champions League football for the first time since 2014. 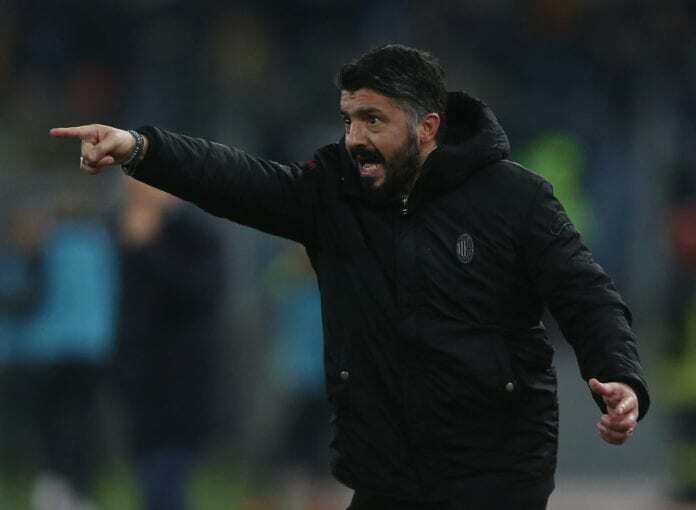 Gattuso’s men have only claimed three wins in their last seven Serie A games following a run of tricky fixtures, which recently involved Napoli and Roma. But Milan’s next five opponents are all in the bottom half of the standings and could potentially offer them a chance to establish themselves in the top four. Although Gattuso is taking nothing for granted given Milan’s slip-ups in recent years. “It’s important to stay focused, knowing that for the past seven or eight years we have reached spring and not been in the running for a Champions League spot,” said Gattuso on the club website. “We need to be in a good position when we come to play our final games of the season, this is our objective. “The players have had the opportunity to rest a bit this week, often it’s better to rest than work. Playing before the others has helped us because when we’ve played teams that have less games than us we’ve tended to struggle. In their last 10 league outings, Milan have only found the net eight times and conceded five. “We certainly need to improve technically and fill the penalty area more, and sometimes this can be put down to laziness,” added Gattuso. “However, in order to not concede goals, you have to work hard. It’s all a question of how you are mentally, and we’ve trained to play a certain kind of football. The Milan and Cagliari will take place at the San Siro on Sunday with kick-off set for 8:30 PM (CET). Previous articleWhat has gone wrong for Coutinho in Barcelona? Next articleQuiz: How much do you know about the Top 5 leagues?